On my last Saturday night in Cachirulo Obelisco, Buenos Aires last September, Hector (the famous, flamboyant organizer) came up to me and invited me to dance a “despedida” dance in Cachirulo El Beso on the following Tuesday and did I have someone in mind I would like to dance a Tango with. The invitation was accepted, eagerly, and of course I had someone in mind to dance with me. Who else but Claudio Strang this year? He accepted….now the only thing left to decide was which Tango would we dance. Well, this is quite a difficult question if you love to dance Tango. Which one? Should the tempo be slow..or fast? Melodic or rhythmic? Which orchestra? Vocal or instrumental? And let’s not forget having both partners agree to the same selection. Fortunately we had planned to get together anyway and film a few videos so we thought some tango would spring to mind and it would be relatively easy to come up with a selection. During our filming we decided it would be nice to dance Pocas palabras by Tanturi/Castillo. Having gotten to El Beso later than usual for me, after dancing one tanda, Hector came up to me and said that after the next tanda we would do the demo. He wanted us to dance earlier than usual because there probably would be a lot of people that wanted to leave early as there was an important football match on. Claudio and I are introduced, everyone is told it is my ‘despedida’ (good-bye or farewell) and the music comes on. Well both Claudio and I look at each other with surprise as the first notes are played….we laugh, embrace and begin our fun. With all the best planning in the world anything can happen in Buenos Aires. As the first notes echoed out we realized that someone misunderstood which song we would dance…instead of dancing Pocas palabras by Tanturi…we heard Siete palabras by Di Sarli, which we had never even danced to before together! We had a good time and having danced many years in Cachirulo El Beso, it felt great to have to a chance to dance in front of many friends and the incredible wonderful dancers that go there regularly. Thanks again to Hector and Norma of Cachirulo. 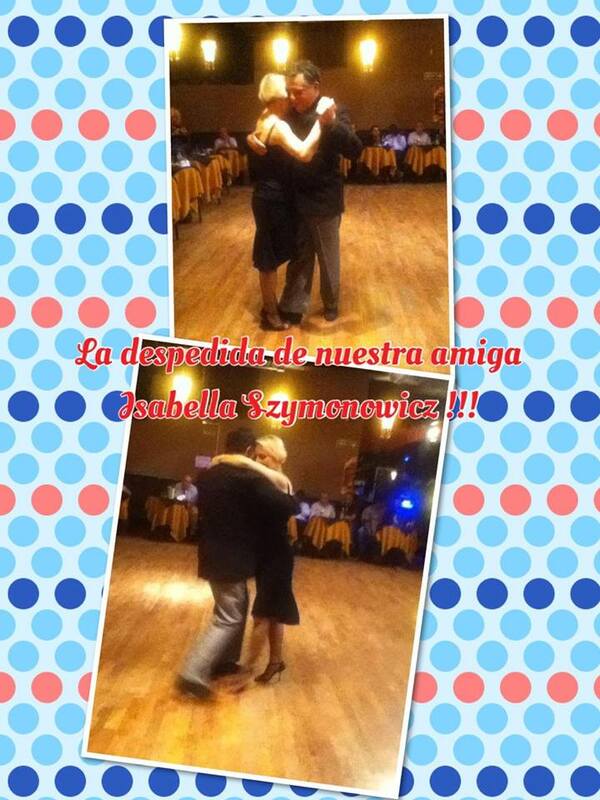 This entry was posted in claudio strang, Isabella Szymonowicz, tango argentino, tango milonguero.